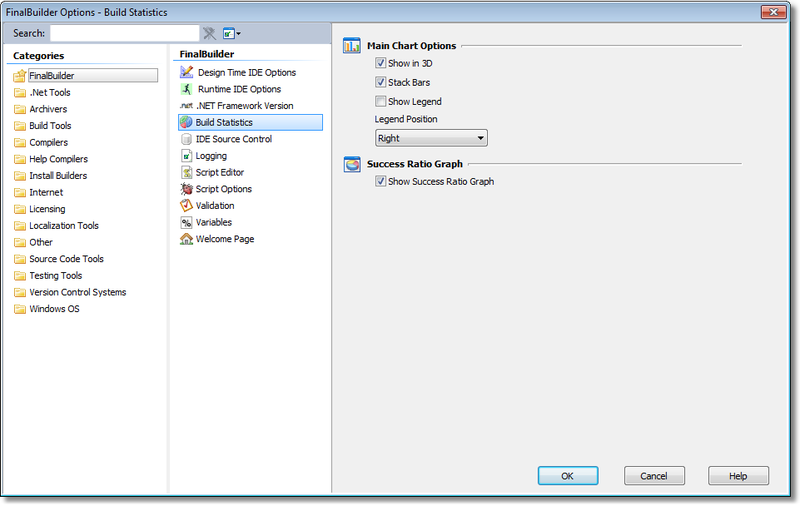 There are a number of visual options for you to change the graph layout to suit your requirements. The options are available in the main FinalBuilder options dialog (in the FinalBuilder category) or can be accessed by clicking the Graph Options button in the Build Stats tab. Show in 3D - the bars are shown with a three dimensional visual effect. Stack Bars - the failure and success bars are stacked on top of each other. Show Legend - the legend is displayed on the graph. Legend Position - the position to place the legend if it's enabled. Show Success Ratio Graph - shows a pie chart of successful and failed builds, and related statistics.